Born in Macedonia, Teresa moved to Ireland when she was 18 and then on to India where she spent most of her life helping the poor. She was an Albanian-Indian Roman Catholic nun and missionary and founded the Missionaries of Charity, a Roman Catholic religious congregation which had over 4,500 sisters. She received the Nobel Peace prize for her work with the poor and was canonized (recognised by the church as a saint) on 4 September 2016. She passed away in Calcutta on 5 September 1997, the anniversary of which is her feast day. Saint Mother Teresa is connected to the divine temple of holy Mother’s in Atlantis. Her connection to help the innocence in us for its purity and understanding to have the freedom, like our childhood, to acknowledge the compassion from self-Love into our inner child, to create joyful, playful, expansion. Ask to go to Saint Mother Teresa’ temple, of the divine holy Mother in Atlantis, to reconnect to your innocence through your inner child. Mother Teresa is patron of world youth day. “Do small things with great Love: – Mother Teresa. 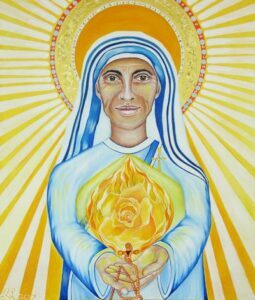 The painting of Saint Mother Teresa emanates her light from the 9th Ray, her shining halo of divine Mother. She holds the rosary in prayer for the innocence for all of us. Her hands are cupped in sending light from the rosary flame around her solar plexus and heart centre. She is looking directly into the innocence of your Self.